Clayton Lainsbury is the Founder and CEO at Crowd Content, and is a contributor to the HootSource blog. Executing an effective social media marketing strategy isn’t easy. You need to frequently serve your audience with relevant content, respond to their questions and comments quickly, and do it all with a touch of personality. You also need to maintain this activity across multiple social networks. Twitter and Facebook are givens, but you may be trying to establish a presence at other networks too like LinkedIn, Google+, YouTube, or Pinterest. If you’re like me, you are trying to execute some or all of this strategy and, unfortunately, your job title isn’t Social Media Marketing Manager (meaning you have other responsibilities, too). Yes, some large companies have the luxury of dedicating one or more employees to social media, but that may also mean their social strategies are more aggressive, cover more social networks and speak to a larger social audience. Any way you put it, when social media marketing is done right, it’s demanding on your resources. So, how can you do all the things necessary to succeed with social media while still leaving time to do the rest of your job? Lucky for you, a ton of tools exist today that help you automate your social media marketing efforts. The key is picking the right mix of tools and techniques for your strategy. Note the sub-header for this section and the word, “Some”. That’s a word you want to keep in your back pocket while you venture down the social media automation path. The truth is that social media automation has to be approached with caution. There really are too many tools available for the busy marketer today. 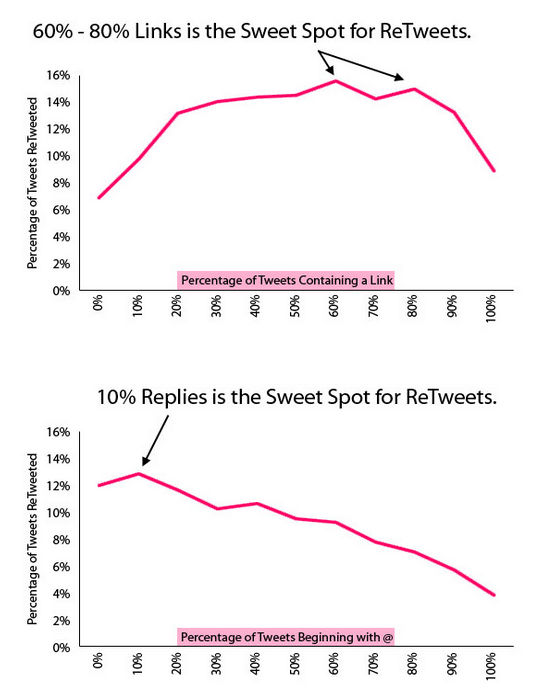 This makes it tempting for marketers to automate their entire social strategy. Don’t be that guy. Automating too much can leave your brand looking like a robot and ruin your social media presence. It can also get you in trouble if your automation station makes a bad call and tweets something inappropriate. For example, during Hurricane Sandy last year, several local businesses were promoting events that had been canceled for obvious reasons. This not only comes across as insensitive, but it’s completely inaccurate. Many people still have no idea what social media automation is; I wonder what they were thinking about the respective brands when they read such tweets. Zarrella’s findings prove that personal conversations on Twitter are not the only drivers of success, thus implying that social media automation can have its place in your social strategy. With any strategy, it’s always a good idea consider your brand and audience for at least a couple minutes. Is your audience particularly averse to automation? Does automation conflict with your brand’s messaging? Or maybe it’s the opposite. Maybe your company provides automation services for your clients. In this case, it may add to your social angle by loading up on the automation tactics. Finding your optimal balance between automation and conversation may take some time. Pay close attention to how your audience reacts to both your automated and manual actions on each social network. Use these reactions as feedback and make adjustments to your mix. Regardless of how poorly this reflects on your brand, I’m asking you not to do it for the sake of everyone else on Twitter. This tactic has basically rendered the DM tool on Twitter useless. If someone does send you a “real” message, there’s a good chance you’ll never see it due to the jungle of automated responses within it must reside. Or, if you do, keep an eye on them and be ready to make changes if necessary. Scheduling a month’s worth of posts in one sitting and then taking a hike is a sure way to dish out inaccurate or offensive information to your audience. This is how the local businesses discussed earlier in this article got in trouble during Hurricane Sandy. We can make this easier by just saying don’t share content that a “human” hasn’t approved. This comes into play when using tools like Paper.li. I have nothing against Paper.li, but many marketers do use it inappropriately, adding a lot of risk to their social campaigns. If you’re using a tool like Paper.li to find content for you based on hashtags, keywords, or other variables, you still want to take a look at that content before you share it with your audience. It’s just too risky to “auto-share” content that hasn’t been vetted by a human eye. Tools like HootSuite can add a touch of automation that complements your personal efforts. Studies show that certain times of the day or week can greatly increase the chance that your social posts will be seen and shared. If you’re in a different timezone than your audience, tools like this can be golden, saving you from waking up in the middle of the night just to send a tweet (not cool). The amount of content being published every day is ridiculous. Nobody expects you to read every single relevant blog in your industry, each day, to find great content to share. Using a tool like Curata, for example, can drop a bundle of relevant content on your lap every morning, allowing you to easily browse it in one place. This saves you time and ensures you don’t miss any “hot” content. The only warning here, again, is to not automatically share any of this content before reviewing it yourself. Automation isn’t only about software. For example, a big contributor to your requirement for automation is probably a lack of manpower. Use platforms like Crowd Content to hire a virtual team of writers that will research and create tweets or Facebook posts for your brand. 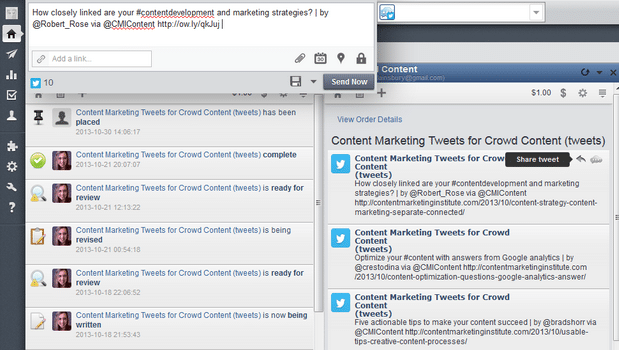 Furthermore, you can connect your HootSuite account to your Crowd Content account, allowing your tweets and Facebook posts to automatically appear on your HootSuite dash, where you can send them to your various social streams. Now that we understand the benefits, risks, and pitfalls of social media automation, we’re in a position to formulate our strategy. As we learned in this article, using the right balance of automation and conversation will be imperative. In part 2 of this series, we’ll walk you through setting up and executing a social media marketing strategy that leverages automation appropriately to save time, expand reach, and stay consistent. Clayton Lainsbury is the Founder and CEO at Crowd Content, a marketplace connecting businesses with talented writers. He believes that content is the foundation to successful marketing, and often shares his ideas at Crowd Content Resources.